We recommend visiting from 8 am until 8 pm, after that time we lock our doors as most residents are asleep. But you are welcome to visit 24 hours a day. Please call in advance for after-hours visits to ensure access. We strive to create social programs and individualized activities to match the capabilities and needs of each resident. This also has a powerful impact on the healing process of those residents involved in some type of rehabilitation. Specific activities include: active resident councils, musical performances, current events update, reading the newspaper, singing exercises, fitness activities, stretching exercises, religious meetings, outside entertainment, games, trivia, history, and volunteer involvement. We also strongly encourage families to participate with the residents in various activities. A monthly calendar is posted to keep residents informed of upcoming events such as birthday parties, movies, musical programs, outings, candlelight dinners, ice cream socials, and other special events. We always welcome friends and family to visit and attend our special events. What role does Social Services play? Our social service team assists both residents and their families during transitional periods. They also provide essential information, manage requests and concerns, help in the care and discharge planning for each resident. They can arrange professional services for dental, vision, podiatry, audiology, power of attorney, dementia assessment, psychosocial and psychiatric evaluation, and individual therapy. How is the laundry done? Can family members take laundry home? Should you wish to have your laundry washed by us, please notify the front office upon admission. Subsequently, if a family/caregiver is going to take care of the laundry at home, please let the nursing station know your plans. This way, the staff can place a sign on the closet door notifying our housekeeping staff to leave the clothing for family pick up. We request that family provide a hamper for clothes and pick it up twice a week. All personal clothing is washed in an industrial washing machine at a temperature of 180 degrees. Make sure your loved ones’ clothing is appropriate for washing and drying in these hot temperatures. Avoid bringing clothing that requires cold or warm water, special care, or is subject to damage and fading. All clothing must be labeled. Please label the clothing with the resident’s name, NOT the room number or initials. Mark clearly and in large letters on the inside neckline or waistband. All items must be marked including socks, shoes, and other personal items. What articles of clothing should we bring? We recommend approximately five changes of clothing and a pair of comfortable rubber-soled shoes. All articles should be washed, clearly labeled with the resident’s name in permanent ink and entered into the residents’ personal inventory log in the medical chart. Other personal items should be marked or engraved for identification. We advise that residents do not keep valuable jewelry or large amounts of cash in the facility. Although we do not have a formal policy stating visitation guidelines, we suggest using the common areas of the facility to meet with your loved one. If it is not possible to visit in one of the common areas, we suggest a limit of one to three people in a resident room at one time. You may reserve the sunroom or family room located in the RCF for any special events (birthday, holidays, meals) with notice. We encourage children to visit, however, we ask you to alert the charge nurse to anyone visiting the facility under the age 12. Can we bring a family pet to the facility? We would love for your family pet to come to visit. Please remember to clean up after them and take the proper safety measures at all times. All pets are to be kept on a leash and should have all current vaccinations. Physicians generally see residents upon admission and once every 30 days thereafter. However, our nursing professionals are in constant contact with all of the physicians that visit the facility. Some insurance companies require that physicians visit more often. Check with our nursing staff for further information. Residents may have a leave of absence only with a physician’s authorization, which can be arranged through the nursing staff. Upon arrival and departure, the resident or responsible party must sign the LOA (leave of absence) book, located at the nursing station. Consider using our Send a Greeting feature on the website. Just type the recipients’ name and type your message. When it arrives in our email box we will print it and hand deliver it to your loved one. For the safety and welfare of all residents and staff, we are a non-smoking facility. There are designated smoking areas in the outdoor areas. Where should I park when I come to visit? There is ample parking in the parking lot with wheelchair access. Please observe all posted city parking signs. Avoid parking in spaces specifically reserved for the handicapped, employees and physicians. Can I bring in my loved one’s favorite food? Consistent with the provision of special diets, always consult with the nursing staff before bringing food to residents. Any food kept in the resident room must be in properly sealed containers. Yes, we have beauticians available. Will my loved one’s room have a television? All of the rooms currently feature free cable television. However; feel free to bring in your own television from home. Please consult with our maintenance director to ensure proper placement according to county fire codes. Will my loved one have telephone access? All of the rooms have telephone hook-ups. However; feel free to bring a telephone from home. Please inquire with the social services to get the telephone working. Will my loved one have internet access? WiFi Internet is provided for residents and their guests. What kinds of activities are planned for the residents? We have a vibrant atmosphere with dynamic, individualized activities that match the capabilities and needs of residents and their guests. We also have active resident and family councils and volunteer programs. Scheduled activities include music, fitness activities, religious meetings, outside entertainment, games, gardening, field trips/outings, and volunteer involvement. If you would like to arrange something special or have suggestions and ideas for individual or group activities, please inform our activities director. We welcome and encourage involvement from family and friends. Will Medicare cover my stay in the facility? Residents must have a Medicare card that reads “Hospital Insurance.” They must also be admitted to the facility with a physician order within 30 days of a three consecutive night hospital stay. Generally, during the first 20 days of care, Medicare will pay 100%. For days 21-100, a daily co-insurance co-pay is required. Medicare does not cover skilled nursing fees over 100 days. Who do I talk to about food preferences? Are there alternate options to each day’s menu? Upon admission, our Registered Dietitian and/or Food Service Director will interview your loved one regarding special needs with regards to food preferences. Our own food service personnel prepare all the meals. Special care is taken to serve flavorful and appetizing foods. All menus are developed according to prescribed medical diets ordered by the physicians. Should you wish for another food item on a particular day’s menu, please make the CNA aware of your request. This information will be passed on to the Food Service Director and they will try their best to accommodate needs. Our Dietitian and Food Service Director also monitor nutritional status using monthly weights, daily intake records, and relevant lab data. The results of these assessments are discussed at care conferences. What do we do if we have personnel concerns? Our primary concern is that your loved one feels comfortable here and that their needs are being met. You should feel secure and at ease with our staff, particularly those providing direct care. If you have any concerns or praise for our staff, please feel free to contact our social services department. They will be able to address any apprehensions you may have regarding any particular staff members. An Ombudsman is an advocate for residents. They are a third party person NOT employed by the facility who comes by the facility periodically to monitor the activities of the facility. They are not able to tell the facility what to do but are able to be a voice for a resident with a concern. We employ a full-time Business Office Manager for all financial and billing concerns. Should you have any questions regarding these matters please make an appointment to see our Business Office Manager by contacting the front desk/receptionist. What is the difference between a CNA, LPN, and RN? A Certified Nursing Assistant (CNA) is a health professional who works under the supervision of Registered Nurses (RN’s) and Licensed Practical Nurses (LPN’s) to provide a wide variety of basic hands-on resident care. CNAs perform basic nursing functions such as personal care, taking vital signs, positioning residents, and ambulation. An LPN provides basic bedside nursing care to residents under the direction of a physician or registered nurse. Duties within the scope of practice for an LPN typically include but are not limited to, provision of basic hygienic and nursing care; measurement of vital signs; basic client assessment; documentation; performance of prescribed medical treatments; administration of prescribed medications; and, the performance of non-medicated intravenous therapy and blood withdrawal. An RN’s duties may include everything a CNA and LPN carry out, in addition to administering an IV, assessment of residents, skin care, and processing doctors’ orders. Furthermore, RN’s typically take on management positions such as the Director of Nursing, who is responsible for all nursing duties in the building. What happens when my loved ones stay is over? What options do we have? If you are ready to take the next step in your recovery, Assisted Living is a natural progression. Assisted Living centers (sometimes called Retirement Centers) provide care for seniors who are healthy enough to not require nursing or therapy but are not quite sure if they are ready to transition home alone. Assisted Living centers cater to seniors who want a more “homelike” environment but with the added security of someone to check up on them 24 hours a day. Services typically include medication management, a wide array of activities, transportation to doctor’s appointments and outings, furnished rooms, healthy and balanced meals, and socialization. Assisted living residences are registered, licensed or certified at the state level, usually by the Department of Health. Prior to discharging home, make sure to think about the environment you will be returning to. How many steps do you have to climb? Do you have adaptive equipment to aid in bathing? Who will be providing you groceries and cooking? How will you get to doctors’ appointments or the pharmacy? Can you care for yourself independently? Local agencies and associations may offer services for the senior community still living in a home setting. These services can include friendly visiting, home-delivered meals, personal home care services, senior centers, transportation, financial counseling programs, etc. It is highly recommended that you thoroughly research the vast number of Home Health companies. Senior housing is apartment or condominium properties for persons age 55 years or older. 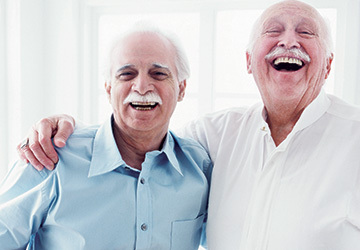 Senior housing complexes do not generally provide meals or personal care services to residents but they may offer social activities, transportation or other services. Services will vary depending on size, location, necessity, and cost. Independent living communities are usually large groups of senior housing units. Like senior housing, independent living communities are age- restricted and services are mostly limited, but they will vary from community to community. © 2019 YoloCare. All rights reserved.